Supported by Capella University and Humana. The coolest swag that shows your nurse pride is only available through the ANA e-store. Shop totes, shirts, water bottles, notebooks, and more — all featuring the National Nurses Week 2019 theme: 4 Million Reasons to Celebrate! Friends and family can celebrate, too, with unique gifts to recognize your loved one’s dedication to healthcare. New this year: Honor a Nurse gifts! Proceeds from your purchase will go towards the American Nurse Foundation’s Honor a Nurse Campaign. We recognize the difference you make as a nurse! Your caring covers many aspects: you, your patients, staff, community, our country and the world. How do you fit in and contribute to advancing nursing? What can you do to keep nursing’s professional presence in the public arena? Hosted by ANA in support of Nursing Now’s effort to improve health by raising the profile and status of nursing worldwide. Apply one idea to further your professional presence. Reflect on how nurses can improve healthcare. Are you looking for ways to use your expertise to create a healthier world? Join us for our National Nurses Week webinar and get insider strategies from top nursing leaders including ANA’s new president, Dr. Ernest Grant. PLUS, you’ll earn 1.0 CNE contact hour! Hosted by ANA in support of Nursing Now’s effort to improve health by raising the profile and status of nursing worldwide. Participate in efforts to elevate more nurses into leadership positions – maybe even you! Join the conversation on Twitter with #NursesWeekLive. During the webinar, you can follow highlights from @ANANursingWorld and engage in discussion with your peers. Following the webinar, you’ll have the opportunity to take part in a special Q&A with nurse leaders. We’ve put together the best materials to help promote National Nurses Week 2019 in your organization! 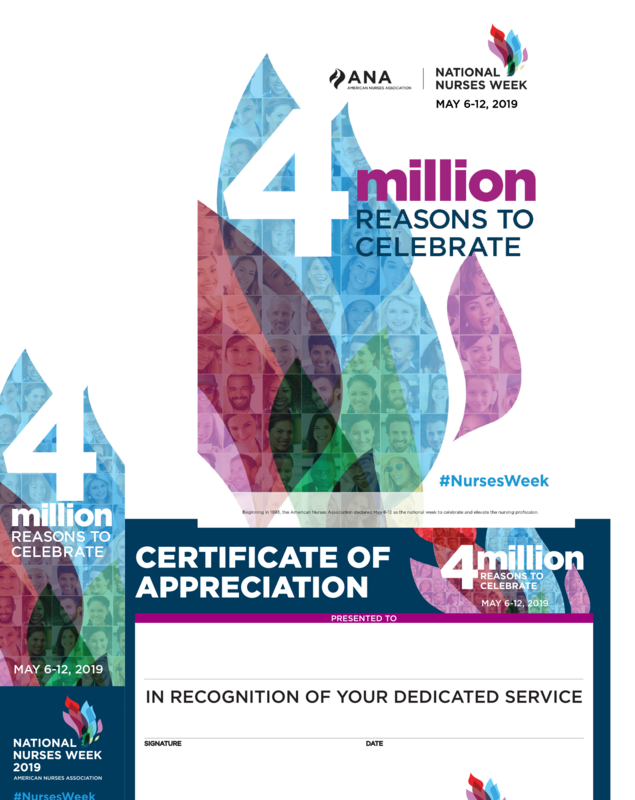 From large banners that let you scream your nurse pride to individual resources like thank-you cards and certificates, use this free toolkit to celebrate National Nurses Week in your hospital, practice, or organization. Give your nurses the recognition they deserve. In 1993, the American Nurses Association declared May 6-12 as the national week to celebrate and elevate the nursing profession. National Nurses Week is a time for everyone – individuals, employers, other health care professionals, community leaders, and nurses – to recognize the vast contributions and positive impact of America’s 4 million registered nurses. Each year, the celebration ends on May 12, Florence Nightingale's birthday. In addition to our popular free webinar and resource toolkit that helps you promote the week within your organization, we also have stocked our e-store with brand new 2019 National Nurses Week gear. Plus, we have a ton of fun activities planned for you through our various social media channels . Stay tuned to participate in contests, get great life hacks from fellow nurses, take part in inspiring stories, and more! Let’s get #nursesweek trending and show our nurse pride! Beginning in 1993, the American Nurses Association declared May 6-12 as the national week to celebrate and elevate the nursing profession. ©American Nurses Association, ©American Nurses Credentialing Center, ©American Nurses Foundation. All rights reserved. National Nurses Week begins each year on May 6th and ends on May 12th, Florence Nightingale's birthday. These permanent dates enhance planning and position National Nurses Week as an established recognition event. As of 1998, May 8 was designated as National Student Nurses Day, to be celebrated annually. And as of 2003, National School Nurse Day is celebrated on the Wednesday within National Nurses Week (May 6-12) each year. The nursing profession has been supported and promoted by the American Nurses Association (ANA) since 1896. Each of ANA's state and territorial nurses associations promotes the nursing profession at the state and regional levels. Each conducts celebrations on these dates to recognize the contributions that nurses and nursing make to the community. The ANA supports and encourages National Nurses Week recognition programs through the state and district nurses associations, other specialty nursing organizations, educational facilities, and independent health care companies and institutions. 1953 Dorothy Sutherland of the U.S. Department of Health, Education, and Welfare sent a proposal to President Eisenhower to proclaim a "Nurse Day" in October of the following year. The proclamation was never made. 1954 National Nurse Week was observed from October 11 - 16. The year of the observance marked the 100th anniversary of Florence Nightingale's mission to Crimea. Representative Frances P. Bolton sponsored the bill for a nurse week. Apparently, a bill for a National Nurse Week was introduced in the 1955 Congress, but no action was taken. Congress discontinued its practice of joint resolutions for national weeks of various kinds. 1972 Again a resolution was presented by the House of Representatives for the President to proclaim "National Registered Nurse Day." It did not occur. 1974 In January of that year, the International Council of Nurses (ICN) proclaimed that May 12 would be "International Nurse Day." (May 12 is the birthday of Florence Nightingale.) Since 1965, the ICN has celebrated "International Nurse Day." 1974 In February of that year, a week was designated by the White House as National Nurse Week, and President Nixon issued a proclamation. 1978 New Jersey Governor Brendon Byrne declared May 6 as "Nurses Day." Edward Scanlan, of Red Bank, N.J., took up the cause to perpetuate the recognition of nurses in his state. Mr. Scanlan had this date listed in Chase's Calendar of Annual Events. He promoted the celebration on his own. 1981 ANA, along with various nursing organizations, rallied to support a resolution initiated by nurses in New Mexico, through their Congressman, Manuel Lujan, to have May 6, 1982, established as "National Recognition Day for Nurses." 1982 In February, the ANA Board of Directors formally acknowledged May 6, 1982 as "National Nurses Day." The action affirmed a joint resolution of the United States Congress designating May 6 as "National Recognition Day for Nurses." 1982 President Ronald Reagan signed a proclamation on March 25, proclaiming "National Recognition Day for Nurses" to be May 6, 1982. 1990 The ANA Board of Directors expanded the recognition of nurses to a week-long celebration, declaring May 6 - 12, 1991, as National Nurses Week. 1993 The ANA Board of Directors designated May 6 - 12 as permanent dates to observe National Nurses Week in 1994 and in all subsequent years. 1996 The ANA initiated "National RN Recognition Day" on May 6, 1996, to honor the nation's indispensable registered nurses for their tireless commitment 365 days a year. The ANA encourages its state and territorial nurses associations and other organizations to acknowledge May 6, 1996 as "National RN Recognition Day." 1997 The ANA Board of Directors, at the request of the National Student Nurses Association, designated May 8 as National Student Nurses Day.